I have had a love/hate relationship with memory foam mattresses for a number of years. You see, I really wanted to love my soft memory foam. I had envisioned being hugged by it and lulled to sleep. Instead, I would sweat like crazy. Not only that, but I would sink into a hole that was hard to get out of. Technology has finally caught up with the promise of what memory foam mattresses should be. Thanks to mattress companies like Leesa, I can finally have a memory foam mattress that offers support and won’t make me overheat. How good is the Leesa memory foam mattress? Read our Leesa Mattress review and see for yourself. Adapts to all body weights and sleep positions. Summary: If you are considering buying a Leesa mattress but aren’t sure if you will like it, I say go for it. You have 100 days to decide so there is no risk. The only cost to you will be your time spent on a mattress that didn’t suit your needs. How is the Leesa Mattress constructed? Before we get into the Leesa mattress review, I would like to talk about the company. Leesa is a company that not only thinks about their bottom line, but also thinks about being a good corporate citizen. For every ten mattresses sold, one is given to a homeless shelter. That is ten percent of their sales going directly to help people in need. In addition, they have partnered with the Arbor Day Foundation to plant a tree for every mattress that is sold. With this initiative, they plan to have over one million trees planted by 2025. Finally, they give extra time off to their employees and executives to volunteer in their local communities. It’s not everyday that you can feel good about a purchase because you know that the company is doing good deeds for their employees, the environment, and those in need. Of course, if the mattresses weren’t so comfortable, it wouldn’t matter. Nobody is going to buy an uncomfortable mattress because the company that makes them is charitable. It is a nice feeling, however, to know that when you slip onto an incredibly cozy mattress, a person in need is also sleeping comfortably thanks to your purchase. Not only has technology caught up with the way memory foam mattresses are made, it also has changed how they are sold. Remember the days of going to a showroom and being pressured by a salesman into the most expensive mattress? Then, to save money and shipping time, you had to tie the mattress on the roof of your car and hope you didn’t cause a major accident if it came off. Now, you can shop online and have the mattress sent right to your door. Not having a middleman in the process means you save a bundle. Since memory foam can be compressed, there are no coils in the mattress. You can have a full sized, 10-inch thick mattress sent to you in a box that is only 45 inches tall. The only downside is that you can’t test the mattress before you buy it. The remedy for that is a 100-day money-back guarantee. After you buy the mattress, if you don’t like it, you simply notify the company, and they will give you a full refund. They will come to your house and remove the mattress, which they will then give to a local charity. You will not pay any shipping costs for them to take the mattress back. There really is no downside to shopping this way for a mattress. When your mattress arrives, you will be greeted with a 45-inch tall white box with a light blue Leesa logo on the front. It usually takes about a week to arrive once you have ordered it. Looking at the box, you will think that there must have been a mistake. There is no way a queen-sized mattress that is 10 inches thick could possibly fit into that box! Yet, you will see that it did fit and that the box contains an incredibly comfortable mattress. Once you remove the compressed mattress from the box, you will need to take it out of the plastic vacuum bag that it is sealed in. Carefully cut it open, and remove the mattress. It will start to decompress as soon as it comes out of the bag. Don’t be put off by the chemical smell. That is normal for any memory foam mattress and it will dissipate quickly. Within an hour, you won’t notice it. You will need at least a day for the mattress to completely open up and be a uniform 10 inches thick throughout. You may be tempted to sleep on it right away, but it is recommended that you wait 24 hours. Leesa recommends putting your mattress on a platform bed frame. Different surfaces will affect how the mattress feels and performs. If you already have a box spring and don’t wish to change your bed frame, you should add a bunkie board. That will keep the mattress level and make sure you are getting the proper support. You can use a slatted base frame if you choose. Make sure the slats are three inches apart and are not the curved kind. Your bed will form over the slats and end up arched, making your mattress useless. Keeping your Leesa mattress on the right type of frame will ensure you are getting the most out if it. 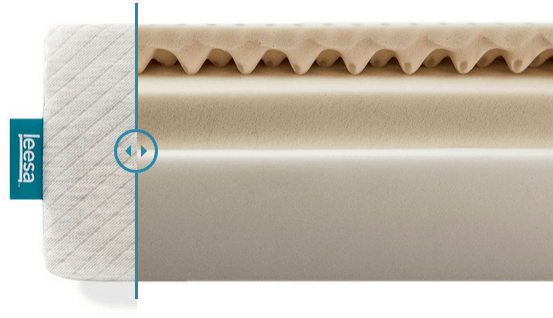 The Leesa memory foam mattress is made up of three distinct layers of memory foam, each with its own special properties. The top layer is two inches of Avena foam, a unique hybrid latex. It’s an egg crate design, but upside down. It is specially designed to allow airflow through it. That’s great news for people who tend to be warm when they sleep; it doesn’t cause you to sweat. It is firmer than most memory foam and also has more bounce back. One of the reasons I was never a fan of memory foam was because, when you sink into it and then move, the memory foam would take awhile to regain its form. This layer helps the mattress feel more like a traditional mattress. The middle layer is two inches of high-density memory foam. This is more like a traditional memory foam that will mold to the contours of your body for maximum comfort. The bottom layer is also a high density foam measuring six inches thick. This is the layer that gives you support. You won’t sink into this mattress like you would in many other memory foam mattresses. The layers are held together by a cover that is made of a single piece of fabric. There are no seams at all which not only looks cool, but also offers a mattress edge that sinks to the same level as the middle. Literally, rolling out of bed is no issue without an edge. As far as softness level, it’s hard to say for sure since different bodies will sink into the mattress differently. A good rule of thumb is that this mattress measures 6-7 on the firmness scale of 1 being softest and 10 being the most firm. That is a plus for some and a negative for others. Most sleep experts agree that a medium firm mattress is best for good back health. Unless you are a die hard soft mattress fan and can only sleep on the softest of mattresses, this firmness should work well for you and also keep your back properly aligned. This is also great news for sciatica sufferers who need lower back support. Your lower back will thank you for sleeping on this mattress. No matter how you sleep, whether on your back, side, or stomach, you will get the support you need while staying extremely comfortable. I have one word of advice, though. Leesa recommends not sending the mattress back within 30 days. It takes some time for the Avena foam to properly break in and really mold to your body. You may find that the mattress is what you were looking for once you have had time to let it do its thing. Of course, if you decide within that 30 days that you don’t want the mattress, Leesa will refund your money with no questions asked. The direct to consumer business model gets you a remarkably well-constructed and comfortable bed at far less than what you would expect to pay. Years ago, you would pay thousands of dollars for this mattress that is currently selling for under $1,000 for a king size. Is Leesa the best memory foam mattress on the market? To many, it certainly is. Since sleep and comfort are so subjective, I can only say that you need to to try it for yourself to see if this is the best mattress for you. I think it is, but don’t take my word for it. See for yourself. I hope you've enjoyed our Leesa mattress review and hopefully it's provided you with enough information to determine if it's right for you. If you have any questions, as always, please leave a comment below.